On our 8-day visit to Siem Reap we explored incredible temples, visited interesting museums, found unique local art, and got dysentery. Leaving Koh Phangan was a bit easier than getting there, but it was not without challenges. An early morning departure for the 7:30 AM ferry to Koh Samui brought a shocking sight. 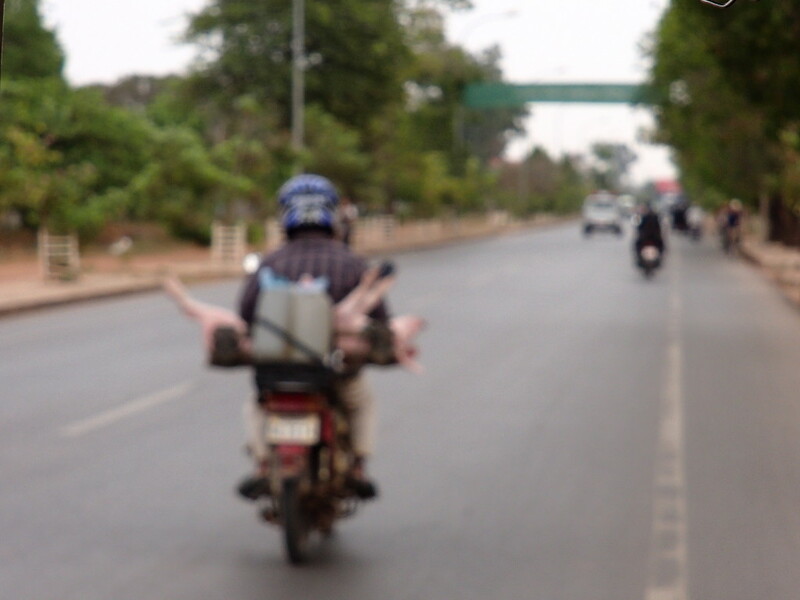 As the tuk tuk drove along the quiet streets we saw a dead body in front of a building. It was a Western male and the police were on scene. Afterwards, we searched online for a news story, but could not find anything. The ferry departed one hour late – it was a good thing that we had a three-hour window before the flight. Boarding the Lomprah catamaran was a bit easier than the speedboat – the boat has an enclosed, air-con cabin with rows of chairs, a TV, and toilet. After a very (emphasized – very) rough 30-minute ride, we crowded into the Lomprah van for a 35-minute drive to the airport. We flew Bangkok Airways from Koh Samui, connecting in Bangkok, to Siem Reap. There was a one-hour window for the connection, which we learned is not enough time. The flight departed Koh Samui 15 minutes late. In Bangkok, we deplaned on the tarmac and had a 5-minute bus ride to the terminal. The staff announced special assistance for connecting passengers and we felt reassured to see an employee holding a sign for our flight. After checking our stickers (see Travel Tips), she opened a door into the terminal and told us to go to the gate. That sounded easy enough until we couldn’t find the entrance to the gate. We saw the gate on the second level, but there was no doorway. After walking to the end of the terminal we saw an employee and asked for help. He directed us to another security checkpoint that was crowded with a group wearing the same clothes. We waited in line and went through security where the staff opened my bag and looked through everything while I heard them announce final boarding call for our flight. We had been walking with another passenger and asked him to tell the gate agent that we were on the way. After security, Lori ran (literally) through the airport to the gate and thankfully, they were waiting for us. The hotel where we stayed, Navutu Dreams (one of our favorites), provides each room with a designated tuk tuk driver, which was incredibly invaluable. 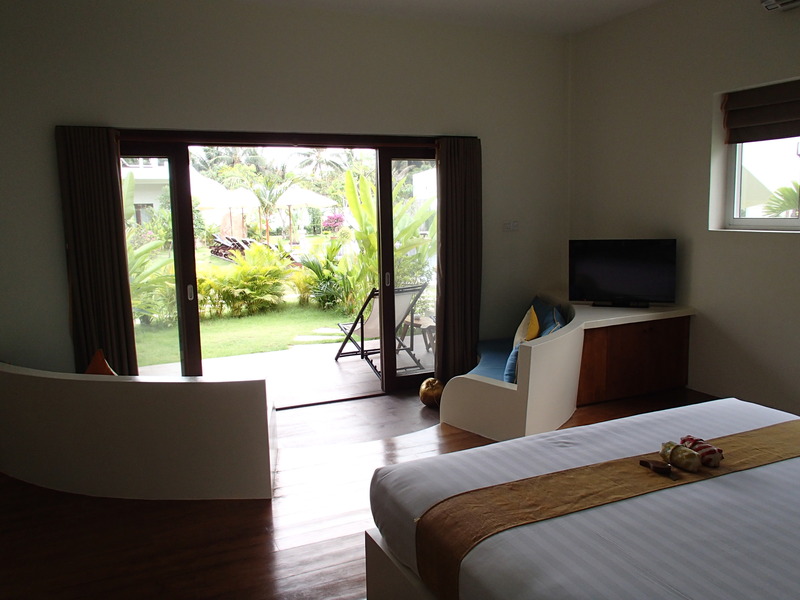 The hotel is a ten minute drive outside of town in a residential area and the temples in Siem Reap are spread over a wide geographic area. It was it was wonderful to not have worry about finding our way around and we enjoyed chatting with Kosal and learning about his life. Since we were going to be in Cambodia for eight days, we purchased a one week temple pass and made great use of it. 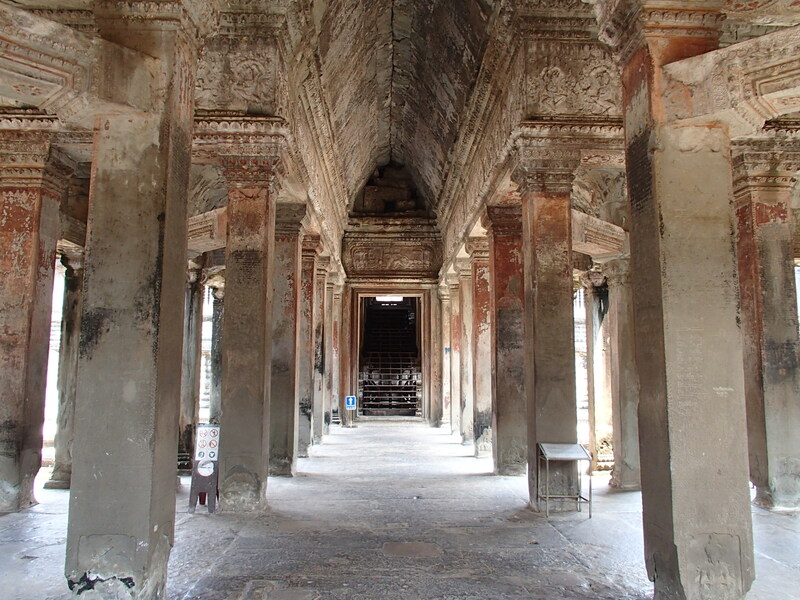 We visited Angkor Wat twice, Bayon at Angkor Thom, Ta Prohm (where Tomb Raider was filmed), Bakong, Preah Ko, and Lolei. 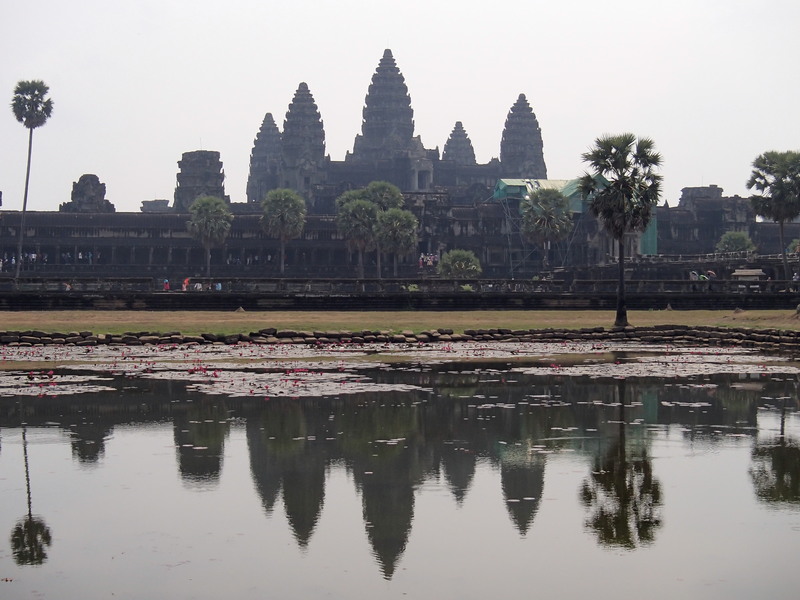 As we walked around the grounds of Angkor Wat, I heard myself involuntarily say ‘wow’ out loud several times. 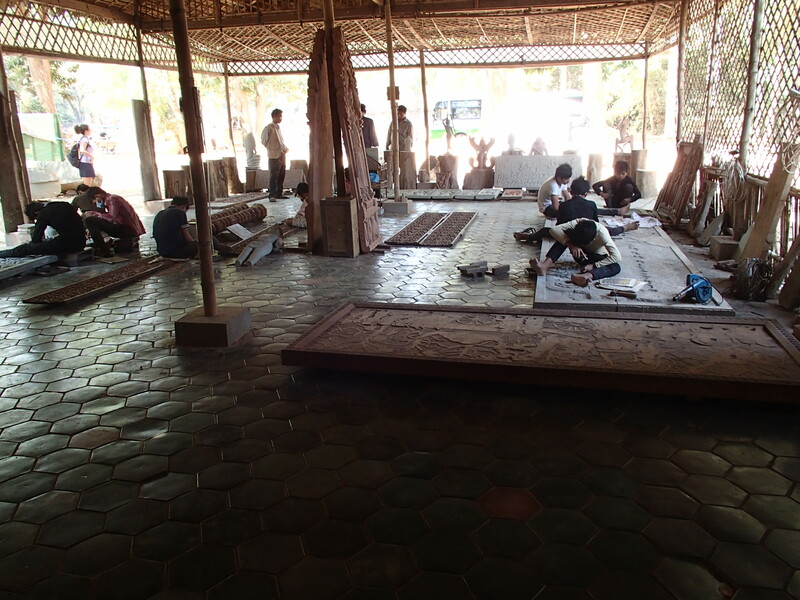 Across from Preah Ko temple, Kosal took us to a workshop that creates stone and wood carvings, Khmer Heritage Arts Shop. They also make incredible wood doors fashioned after the designs on the temple pillars. What is cool about this place is that they provide job training to teens at a local orphanage. On the way back to the hotel, Kosal drove through the area where he lives so we could get a glimpse of village life. We even drove by his father in law walking on the road. 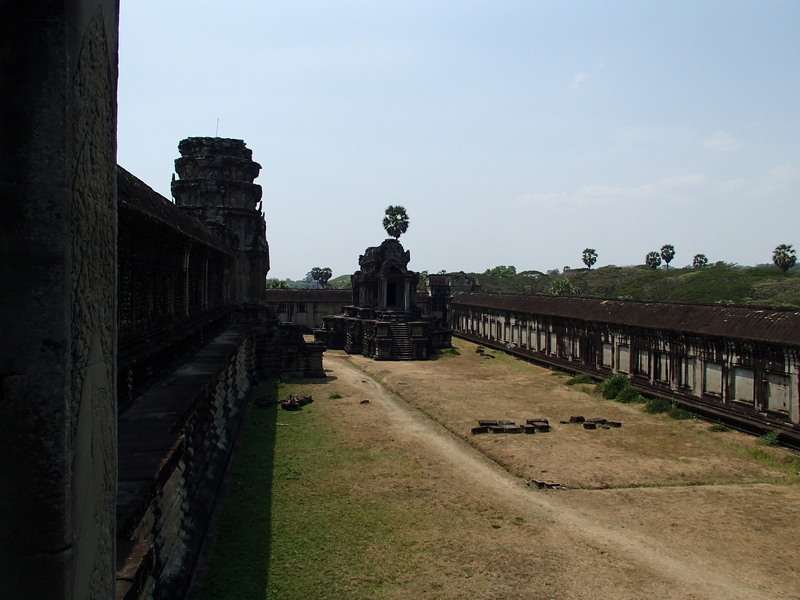 There are several museums in the area – we went to the Angkor National Museum and the War Museum. Unfortunately we didn’t get a chance to go to the Cambodia Landmine Museum, which is a 30-minute drive outside of town. 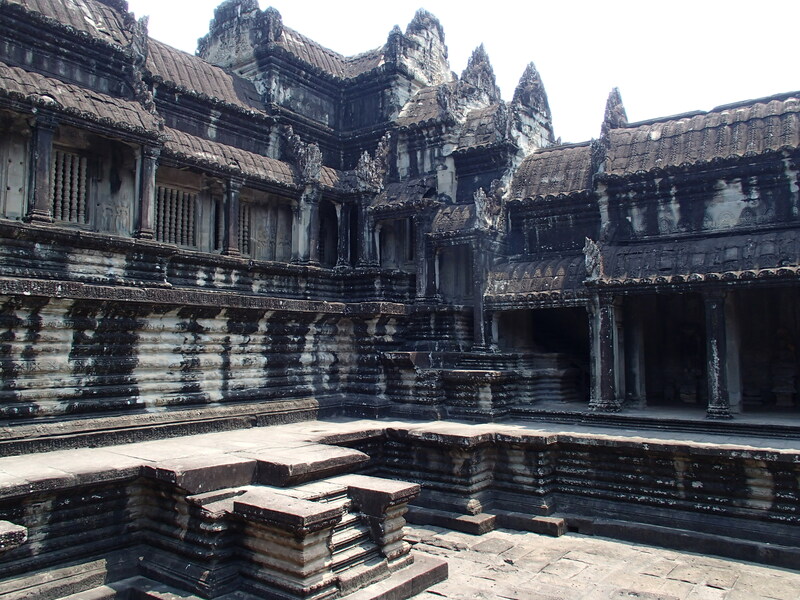 The Angkor National Museum is an indoor museum in the heart of the city. There are seven air-conditioned exhibit halls that spotlight history, archaeology, and mythology – some with video presentations. One hall was filled with tons of Buddha figures. We liked the exhibits that explained Angkor Wat and its artwork. It was very interesting to read about the Hindu mythology. There is a nice gift shop, but it is way over-priced. The War Museum is an outdoor museum on the outskirts of the city. We read on Tripadvisor about the complimentary guides – all veterans – but decided to explore on our own. But when we entered, Tom graciously persuaded us to let him show us around, and we are so glad that he did. Meansokhom, call him Tom, is from Kam Tom province. He was conscripted into the army at age 14 and lost touch with his family, who he still has not located. Tom served as a private in the infantry until 1998 when he lost his arm to a claymore landmine. The museum is set in a quiet wooded area and has a great display of old tanks, guns, weapons, and landmines. There is also the site of a former mass grave. 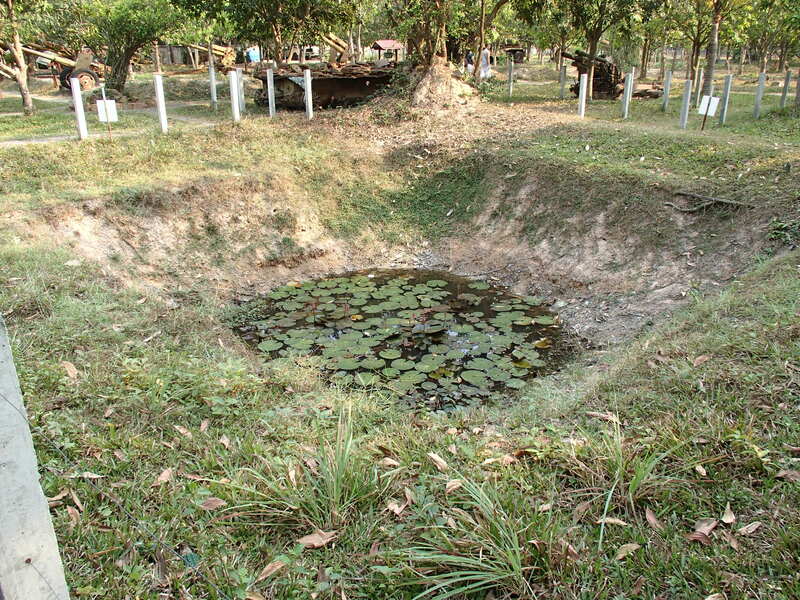 We were shocked to learn that there are still six million unexploded landmines in Cambodia. See our detailed review on Tripadvisor. The city has a mixture of colonial and newer style buildings, along with outdoor stalls. 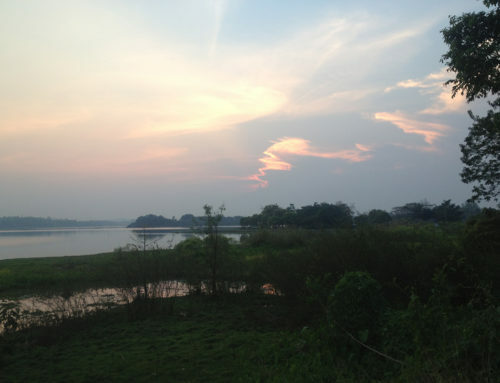 Near the river there is a large park on a wide boulevard with gardens and a Buddha altar. The Old Market area is a good place to go get touristy-type souvenirs like scarves, jewelry, purses made with recycled materials, and carvings of Buddha and animals. 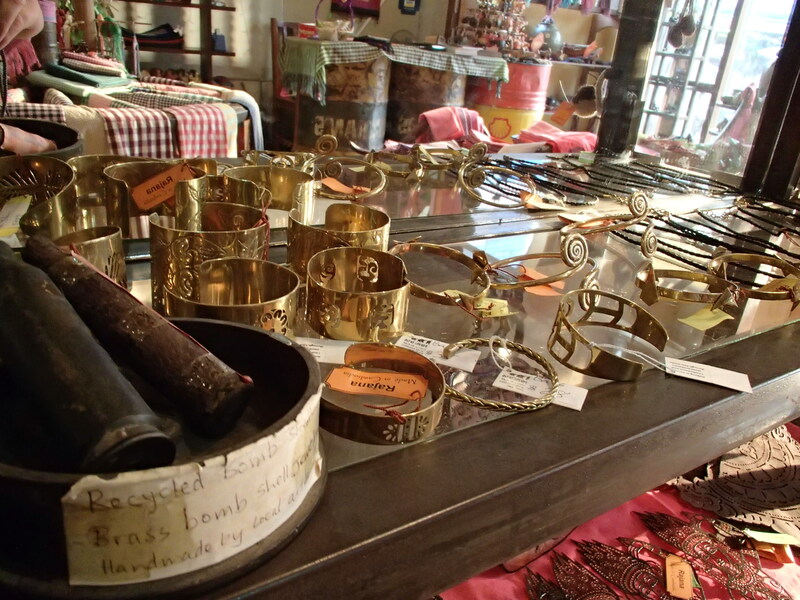 We found some unique shops where we picked up a few things like brass jewelry made from spent bomb shells at Rajana and cool prints by S. Kheang at Art Work Gallery. For dining and cocktails, Pub Street is a popular area with tourists – a few of the restaurants are air conditioned. We ate all of our meals at the hotel after Michael got seriously ill from a lunch at Kitchen Angkor Chey (see below). One day after visiting the temples, Michael picked up some take away in town. We shared two dishes – fried rice with chicken and Amok (fish, chicken, vegetables with Amok seasoning) – but Lori only had a small amount of the Amok. Two hours later Michael developed severe dysentery – first it was diarrhea and then the fever and chills came on (not just chills – he was shaking). Within one hour his fever rose to 103, and when he started throwing up violently we knew it was time to get medical treatment. The hotel staff was wonderful – they called an ambulance, which arrived in about 20 minutes. When we got the hospital, the fever was at 104.3. 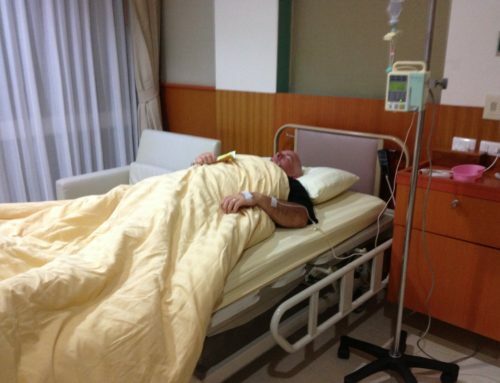 Michael stayed overnight at the international hospital for IV antibiotics and rehydration. By the next morning his temperature was normal and he felt well enough to go back to the hotel. Lori got a very mild case – some diarrhea the first evening and then vomiting the next day. Stay tuned for Michael’s full post soon. Since the terror of the Khmer Rouge regime ended in 1999, Cambodia has seen economic growth and reduced child mortality rates. But poverty is still widespread throughout the country. On the dirt road near the hotel we saw fancy new houses next to small shacks, rice paddies, overgrown fields, rubble, chickens, and lots of stray dogs. Despite the heat, dusty roads, and dysentery, we enjoyed exploring the ancient temples and learning about the culture and history. We would definitely return! Navutu Dreams was one of our favorite hotels. 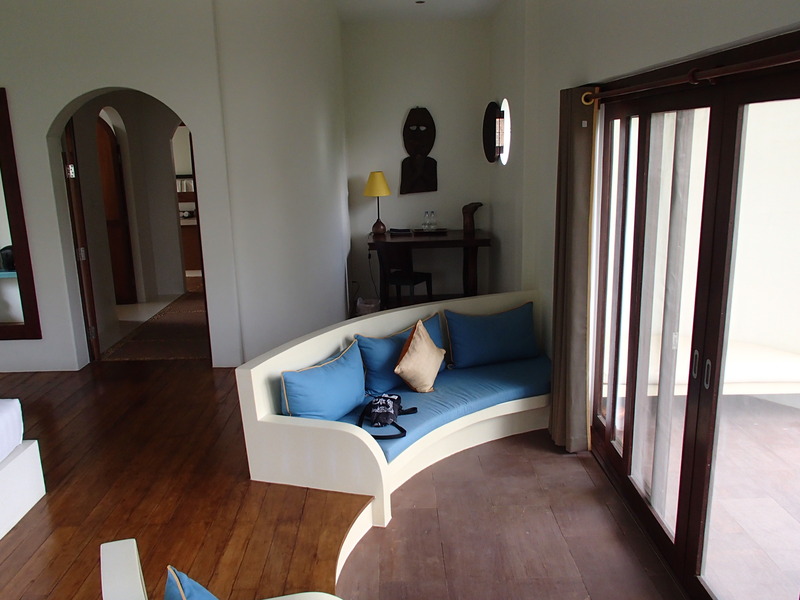 We loved the tranquil setting; open, airy room; and tuk tuk service. Thanks to the staff for being so helpful and concerned when Michael got sick. Ferry: If you are going to catch a flight on Koh Samui, allow several hours between the ferry and flight – just in case. You can purchase tickets in advance at the Lomprah office, online, or at the pier before boarding the ferry. The staff will give you a voucher to provide at boarding. Check the voucher to ensure it correct. If you are prone to getting seasick, you will most likely feel bad on the Lomprah catamaran. The ride is very rough! Airline and Ferry: Keep your stickers! The boats and airlines give different stickers for you to wear, depending on your destination and services purchased. For example, when we checked in on Koh Samui to Cambodia, we got two little airplane stickers to signify that we had been cleared for international travel to Cambodia. We had to show these stickers to the staff who opened the side door in Bangkok. There were several people who could not produce their stickers – we don’t think they made it to the plane. 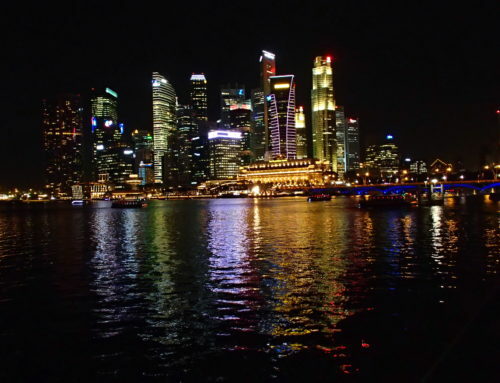 Visa: At the time of our visit, US citizens were required to purchase a visa upon entering the country. You must complete a form, provide a passport-sized photo, and pay $20. Make sure you bring a photo and have cash. Currency: In Cambodia you can use the local currency or the U.S. dollar. But, if you pay in dollars, you will get change in riels. The ATMs dispense dollars. Temples: It is hot and humid and you will sweat a lot. Wear sunscreen, carry a sweat towel, and bring a big bottle of water. Road travel: You will most likely travel by tuk tuk. The roads are dusty and smelly with exhaust and burning smells (e.g., some people burn trash), so many locals wear a mask. We bought masks and they really helped a lot. 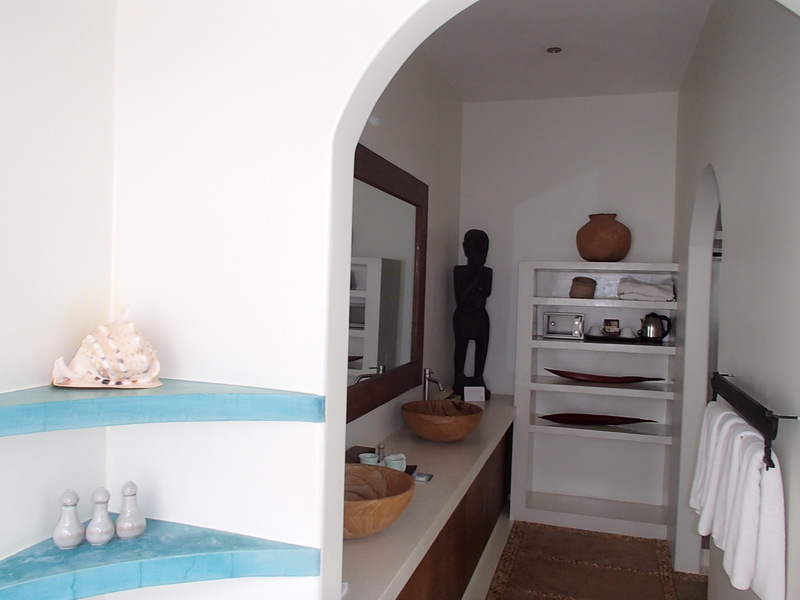 Hotel: Stay at Navutu Dreams – it was wonderful. And ask for Seng Kosal as your tuk tuk driver.